Just as Fielding Yost made an extensive study of stadium design, he also thoroughly investigated methods of financing the stadium. A successful businessman himself, with interests in oil, coal and real estate in Tennessee and West Virginia, Yost was impressed with the University of Pittsburgh's use of bonded debt to fund its stadium. He, in particular, wanted to make certain that the university not conduct a fund drive to finance the stadium as Illinois had done. The Board in Control had realized significant profits with the growth in football attendance in the1920s. In fact, football receipts had enabled the Board to completely pay the cost of Yost Field House in just three years. By all indications a new stadium would quickly pay for itself. The problem was how to accumulate the initial capital to fund construction. A plan was devised, and approved by the Board in Control to finance stadium construction and the facilities called for in the Day Report through a $1,500,000 issue of 3,000 bonds at a par value of $500 at 3 percent interest. These financial instruments bearing the picture of a wolverine would fund not only the stadium, but all the facilities called for in the Day Committee Report. Illustration included in the Michigan Stadium Bond Prospectus from 1926. 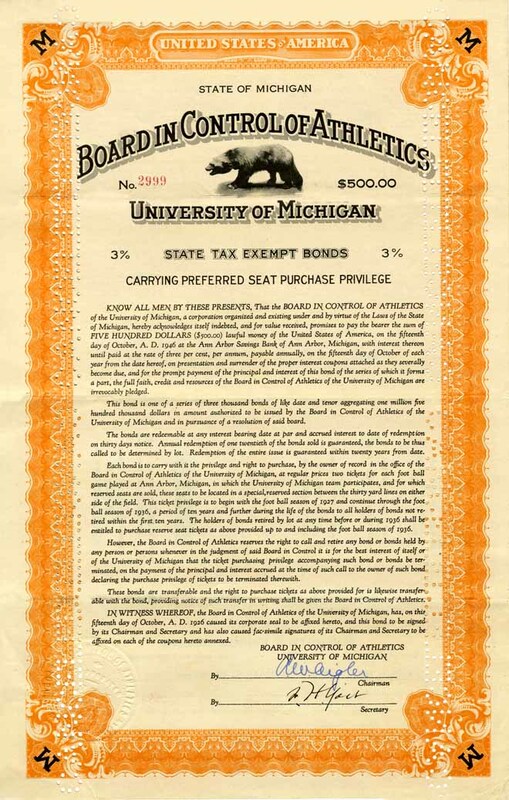 To drum up support for his stadium proposal, Fielding Yost promoted the bonds to U-M Alumni and extended the offer to "any citizen of the State of Michigan." Yost was sure the alumni would look upon the stadium bonds as a good investment. As an added attraction, each $500 bond guaranteed the right to purchase two tickets between the 30-yard lines for a 10-year period. One person even argued that the right to purchase tickets alone was so valuable that the bonds would not have to pay interest. One-twentieth of the bonds were to be retired each year through a random drawing. The ticket privileges were guaranteed for 10 years even if a bond was redeemed. The stadium bonds went on sale August 20, 1926. A prospectus sent to each of the 63,000 alumni described the stadium and athletic building program and touted the bond's ticket buying privileges. "These bonds are reasonably certain to be taken in a very short time" football fans were warned. Bond number one was purchased by former athletic director Charles Baird. For the first 10 days, sales averaged less than 15 bonds per day. By October 1st, when it had been anticipated that the issue would be nearly sold out, Yost began to worry. The alumni were not responding; only 637 bonds had been purchased. Yost and publicity director Phil Pack feverishly developed promotional plans. A new prospectus was prepared for alumni and sent to all Michigan bank presidents and chambers of commerce as well. Pack targeted all Detroit households with incomes over $10,000, the membership of the Detroit Athletic Club, and high income Highland Park households. Suggestions were made to raise the interest rate to 4 percent and extend ticket privileges to 20 years. In a confidential letter, Yost asked newspaper editors to cooperate in promoting the bonds to the general public. "Naturally," he added, "we do not want the public to know that the bonds have been going disappointingly slow." In a radio broadcast over WWJ, Yost tried to dispel the notion that a larger stadium meant no sell-outs. The renewed appeal and warning succeeded as all bonds eventually sold before the 1927 season opener. The contract for excavating a 230,000 cubic yard hole for the stadium was issued to R.C. Merriam of Detroit in October 1926. By May, the site was ready for the Leck Construction company of Minnesota to start pouring concrete. At the same time work was underway at Palmer Field, the women's athletic field house, and the intramural building. With Yost paying attention to every detail of construction and cost, Michigan Stadium was ready for the opening game against Ohio Wesleyan on October 1, 1927. An additional 15,000 wooden seats were erected for the dedication game against Ohio State. As Yost had predicted, all the "big games" were sold out. The next step was to begin paying off the bonds. Between 1927 and 1930, the increased revenue from ticket sales provided the Athletic Department with ample funds to finance its regular operations, undertake additional construction-including the golf course-and to reduce its bonded debt. Five hundred-fifty bonds were randomly selected for retirement by 1930. For the next six years, however, no bonds were redeemed. The onset of the great depression had significantly reduced ticket sales. The department managed a budget surplus, and never missed an interest payment in each of those years, but could not retire any bonds. Redemption of bonds resumed in 1937. By 1940, $625,000 in bonds had been retired. For many bondholders, the stadium bonds proved to be a good investment. By 1940 standards, 3 percent tax-free interest was an attractive rate. A growing number of holders whose bonds were randomly selected for retirement suggested that their bonds be returned to the pool. Eventually, many took advantage of an offer to have their bonds extended for five years at the 3 percent interest rate. 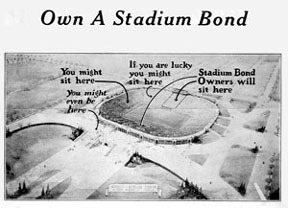 The last of the stadium bonds were retired in 1951. The $1.5 million in stadium bonds represents only a small portion of the money spent on the expansion of athletic facilities over the years. It was these bonds, however, that financed the facility which has given so much to Michigan-including the revenue which has allowed Michigan to build some of the finest intercollegiate and intramural facilities in the nation.